This is the belated post from 19th February. 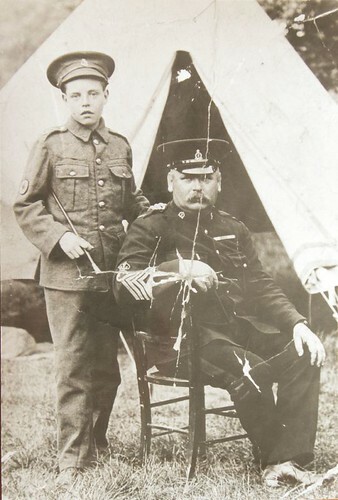 William Arthur West was born in 1863 in Guildford. I became aware of him through the his marriage to my Grandfather’s Aunt – Emma Jane Ellis (Harris). They married in 1897 and raised two children. 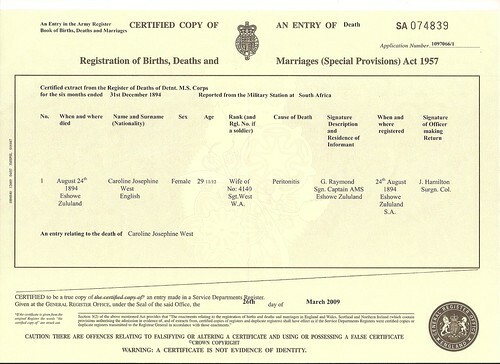 A son called William James born 1898 in Aldershot Hampshire and a daughter, Clara Edith born 1901 in Aldershot. 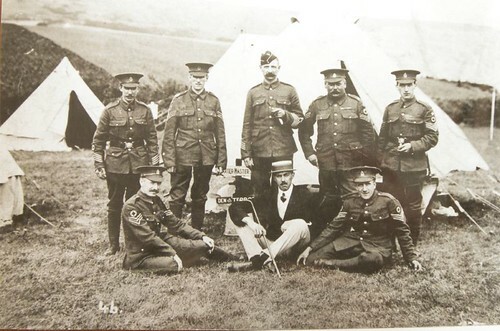 William Arthur is the second from the right in the back row. Here he is again, this time with an unnamed boy soldier, look how young this lad is? By chance I did a Google search on William Arthur. I have never come across anyone researching this family outside of my immediate family so what happened to William and Clara. William James is the subject of another Ancestor of the week post. I also wanted to know more of William Senior. I did know that after leaving the military he owned a sweet shop in Stony Stratford Buckinghamshire. The Google search revealed an interesting website article, although a recent search does not show the article, which is a great shame. Anyway, the article looked at my William Arthur West from the perspective of the community in which he lived, Stony Stratford. The article provided a few clues which I had not been aware of, and I used this as a springboard for further research and to fill in a few gaps into William’s earlier life. I had already been in contact with the author of the article. I had a reply and was delighted to hear that they had quite an archive of material relating to my ancestor. I was invited to come and look at the article. I replied that given the distance it would not be until our next trip north of here and I was really surprised when I was offered the opportunity to receive the archive in the post for my perusal and copying. In due course the file arrived and I managed to copy the entire archive and return with some extra material by tracked post. That is one of the things that I love about genealogy, it is the genuineness of fellow researchers. This entry was posted in Archive - Imported from Blogger and tagged award, awards, Boer War, Ellis, Genealogy, Harris, West. Bookmark the permalink.